One person was killed after at least two tornadoes tore through parts of northern Texas. Meteorologists warned of worsening weather conditions for a broad swath of the state just days after several Great Plains states were pummeled by tornadoes. The twister touched down about 5 miles (8 km) south of Cisco, a small rural town about 100 miles west of Fort Worth, where it tore through several homes in its path, Eastland County Judge Rex Fields, the local emergency management coordinator, told Reuters. Another tornado was reported in Burkburnett, Texas, about 15 miles north of Wichita Falls, according to a police dispatcher, AP reported. 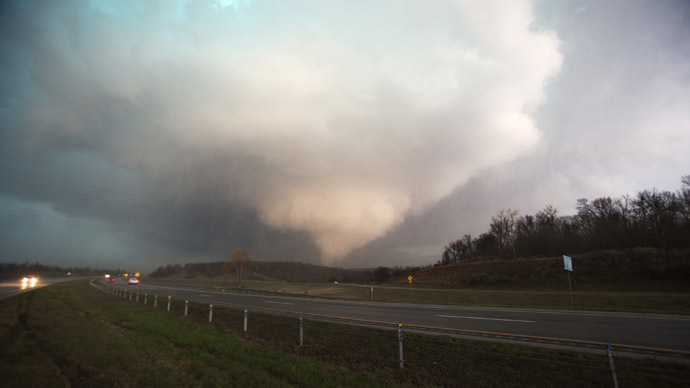 She said the town sounded its tornado warning siren just before 6 p.m. Saturday. Meanwhile, the National Weather Service lifted to "moderate" the possibility of more tornadoes across North Texas. In eastern Colorado, three tornadoes were spotted Saturday, according to the weather service. There were no reports of injuries or property damage. Twisters also touched down on Saturday in western Kansas but thus far no injuries have been reported, said meteorologist Liz Leitman of the weather service's Storm Prediction Center. On Wednesday, severe weather pounded the region from Texas to Nebraska with dozens of reported tornadoes, including several that touched down in Oklahoma, causing one fatality, injuring 12 and destroying buildings. In another part of the country, Tropical Storm Ana - the first tropical storm of the season - was situated 20 miles southeast of North Myrtle Beach, South Carolina, as of 2 a.m. ET, according to the National Weather Service. The storm is expected to reduce in strength as it moves over colder water close to the coast.